Tony and Pulitzer nominated playwright Lee Blessing’s “Fortinbras” opened April 1 at the Reno Little Theater. 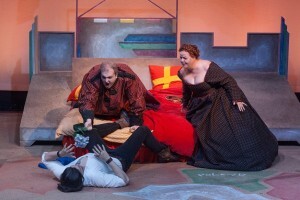 Directed adeptly by Melissa Taylor, the two-act comedic satire pokes fun at self-promotion, revisionist history, modern politics and, perhaps just a little, at the Shakespeare’s tragic characters. Blessing, who lives in New York, attended the opening. I asked him what he thought the great bard had left unsaid. “Hamlet needs a comic sequel,” he replied. The delighted audience certainly got an evening of laughs and more. In the first act Horatio, played by Mark Maher, gives an accurate recounting of the tragedy that befell the royal family, but self-promoting Fortinbras (Cameron M. Shirey) absolutely hates the story. The most fabulous prince concocts a new one, an official version involving a fictional Polish spy as he suggests, “Maybe I can make up the truth.” In modern parlance, we call that public relations gambit “spin.” Honest Horatio is aghast at the blatant revisionism, but what to do? Help arrives in a series of supernatural appearances by a host of ghosts, the victims in Shakespeare’s earlier tragedy. But in Blessing’s tongue-in-cheek sequel, they bear little resemblance to their original characters. I’m not going to tell the whole story, but just think “NymphOphelia,” played salaciously by Chase McKenna. I was intrigued by Blessing’s side story of Fortinbras’ army peacefully invading Poland, Transylvania, Carpathia and beyond. The playwright said he wrote “Fortinbras” during the First Gulf War. “The war is still going on and the Army hasn’t come home, has it?” he said. Comedy isn’t easy. Nevertheless, these fine actors did a masterful job disarming the audience with Blessing’s Shakespeare-esque comedy sketch, so he could slip in a subtle political commentary. No play is complete without direction, behind-the-scenes technicians and a crew that create the sound, lighting and scenery that give productions context. A foreshadow of things to come, Taylor and Set Designer Chad Sweet chose an Elizabethan rock fusion to start the show that switched to pop rock as the play progressed. 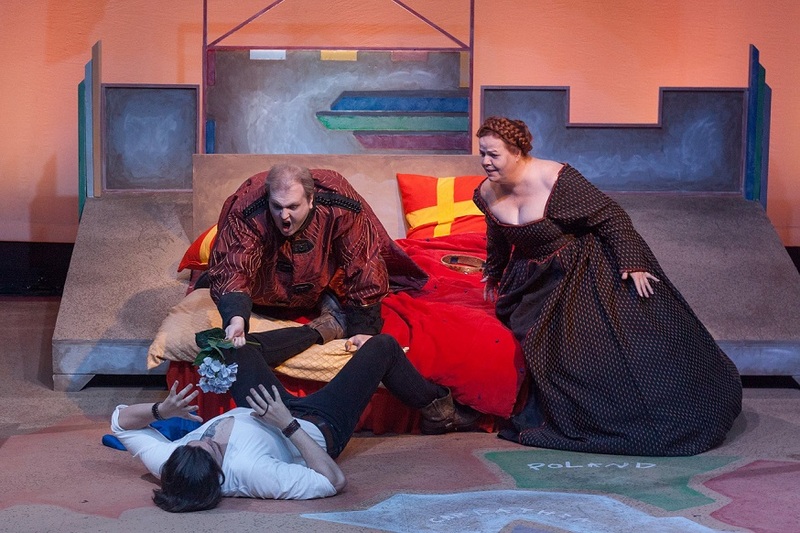 The set is yet another clever design by Sweet: thrones that convert into a royal bed, rolling platforms like movable Lego blocks, and hand-clap-activated mood lighting that transforms the royal bedchamber into a hip bachelor pad. Kudos for these artistic touches that create an ambiance of Shakespearean slapstick. “Fortinbras” was simply a delightful evening of hilarity and insight thanks to a cast of accomplished actors and the astute writing of a prolific playwright. Bravo to Reno Little Theater for bringing such a timely and shrewd comedy that is far cleverer than many will see on the surface. Absolutely a must see. Five giggling and discerning stars.